So let's get this over with first. As a kid, I loved the Dukes of Hazzard. My friends and I would ride our bikes pretending to be driving the General Lee and making jumps. It was a fun show. I get that the Confederate flag in itself is now considered to be offensive. I indeed personally agree with that. However, when I see it atop the roof of an orange Dodge Charger, the meaning of that symbol completely changes for me. It then represents good ol' boys, never meaning' no harm, makin' their way, the only way they know how. They were good guys, fighting for the common man against the corrupt government. March 1963--THE ANDY GRIFFITH SHOW--"The Darlings Are Coming"--Gordon Long says: It's not exactly a crossover, but I just realized that the Darling clan who lived near Mayberry must be related to the Duke family. Not only do the patriarchs of the two clans (Briscoe Darling Jr and Uncle Jesse Duke) look and sound alike (yeah, I know, same actor-as-cousin characters principle) but both families have musical abilities (the four Darling sons were played by a country musical group, the Dillards, and the Duke boys' actors John Schneider and Tom Wopat were country singers). Also, in addition to the common last initial of both families 'D', the Dukes were involved in moonshining and the Darlings were shown to have moonshine jugs around that they made music on, but there is that subtle hint they did moonshining, too. (And in some films from the 2000s, Uncle Jesse---then played by country star Willie Nelson---also is a proponent and user of marijuana.) The original tv series was based on a film called The Moonrunners. The director, Gy Waldron, originated The Dukes of Hazzard. So it's pretty obviously while a few things have be explained (like the Duke-equivalents Uncle Jesse and his family are Haggs in the film), the Moonrunners is part of the Dukes continuity. I also found out that the lady who played the daughter Darling on the Andy Griffith show and in the films also played the character on an episode of Nashville Now, a country music talk show similar to the Tonight Show or Letterman, etc. on The Nashville Network. As many country performers showed up on the Dukes as themselves it is a totally cool crossover with the Charlene Darling character. Oh, and Robert will love this---a recurring character on Nashville Now was Shotgun Red, a very muppet-like puppet.... Shotgun Red was also a recurring character on Hee Haw---just don't recall if he was in any of the recurring sketches or just like the recurring country music guests. More crossover fun for Robert! 1970--THE DUKES OF HAZZARD: THE BEGINNING--This is the movie that came out in 2007. As seen on screen it would take place in TVCU3. Just slightly tweaked, it's a prequel to the feature film in TVCU2. If that feature film is in 2005, then this would take place in 2000 in the TVCU2. However, if we ignore modern technology and pop culture references, the story takes place when the cousins are around 16 years old. The boys don't have their drivers' licences yet, and Daisy is just old enough to get a job, while they are all still in high school. This movie was meant to be a prequel to the feature film and another origin story. 1975--MOONSHINERS--This movie better fits in the Cineverse, but the basic storyline probably also happened in the Dukes continuity, explaining how the Dukes came to be legally restricted to Hazzard County. 1979 to 1985--THE DUKES OF HAZZARD--The adventures of the fast-drivin', rubber-burnin' Duke boys of Hazzard County. 1979 to 1980--DUKES OF HAZZARD--"Jude Emery"/"Mason Dixon's Girls"--The second season episodes "Jude Emery", about a Texas Ranger, and "Mason Dixon's Girls", about a travelling private investigator and his female associates, were both pilots written by Dukes creator Gy Waldron for proposed new shows. Both failed to sell. 1980 to 1981--ENOS--Enos spins off to his own series when he gets a job as a cop in the big city. Click here for Thom Holbrook's review. 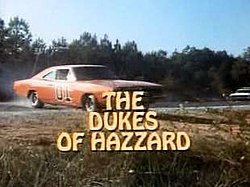 Hazzard County, the Duke Boys, and the General Lee are all elements from the television series THE DUKES OF HAZZARD (1979-1985). Jim Douglas and Herbie are from Disney's THE LOVE BUG (1968) franchise of movies and television series. Bo "Bandit" Darville is from SMOKEY AND THE BANDIT (1977) and its sequels. The community of Mayberry, North Carolina first appeared inTHE ANDY GRIFFITH SHOW (1960). 1983--THE DUKES--An animated version of the show called The Dukes aired in 1983. 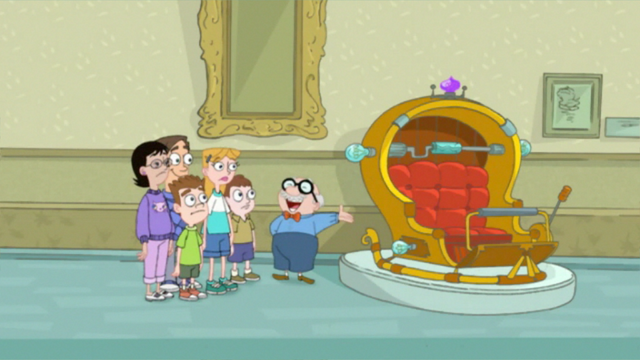 The first season fell under the Coy and Vance era of the live-action show and thus they were adapted into animated form. By the second season, Bo and Luke had returned, and they replaced Coy and Vance in the cartoon. I feel the cartoon could fit. The season with the replacement cousins comes first in the cartoon, and they are racing around the world against Hogg and Roscoe. So I'm saying chronologically, this would take place prior the season 5 of the live action show which introduced the replacements. In the season where Bo and Luke are not there in Hazzard, it's because they were finally legally allowed to leave the county, and went back on the racing circuit. So the second season of the cartoon, with Bo and Luke, probably takes place just before they return to the live action series. If you really hate including the cartoon, it probably also fits in the Cartoon Universe, although I haven't yet found a crossover to place the Dukes in the Cartoon Universe for my upcoming Cartoon Crossover Encyclopedia. The Story: MIchael enters K.I.T.T. into an alternative fuel race when it's suspected that the evil oil companies plan on sabotaging the event. October 1983--ALICE--"Mel is Hogg-Tied"--Boss Hogg tried to buy Mel’s Diner. Click here for Thom Holbrook's review. 1987--SCOOBY-DOO MEETS THE BOO BROTHERS--Sorrell Booke voices the role of a bungling, southern sheriff, much like his character Boss Hogg on The Dukes of Hazard. This may take place earlier in the timeline because of the aging of Mystery Inc. in the TVCU. This could also exist in the Cartoon Universe in 1987 (where aging doesn't matter) but the Boss Hogg link is enough to make it onto a TVCU blog post, but not strong enough for the stricter standards I uphold for the Cartoon Crossover Encyclopedia. 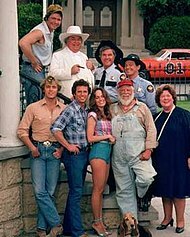 1997--THE DUKES OF HAZZARD: REUNION!--Hazzard County is having a reunion festival, which includes a Toughman-style contest, and a rattlesnake chili cookoff, along with several other events. Uncle Jesse is the grand marshal of the reunion and at the same time, is facing a lawsuit filed by Mama Josephine Maxx for access across Duke property to the Hazzard swamp where she intends to build a theme park. However, Jesse refused access, not wanting to see the swamp destroyed. However, this has made the rest of the townsfolk angry with him, as the new theme park means new jobs, and revenue for Hazzard County. 2000--THE DUKES OF HAZZARD: HAZZARD IN HOLLYWOOD!--Hazzard in Hollywood follows up on the first reunion movie, The Dukes of Hazzard: Reunion! and begins with Bo and Luke Duke partaking in the Hazzard County festival which features actual country music star Toby Keith as himself. When an old enemy of the deceased J.D. Hogg, Ezra Bushmaster, arrives in Hazzard, he donates a significant amount of money to the hospital fund, on the condition that the people of Hazzard are able to raise the rest by a certain amount of time. A music promoter on vacation in Hazzard says he'll buy the master tapes of the performances of music stars who performed in Hazzard. So the Dukes decide to travel to Hollywood to sell some country music recordings to raise the rest of the money. 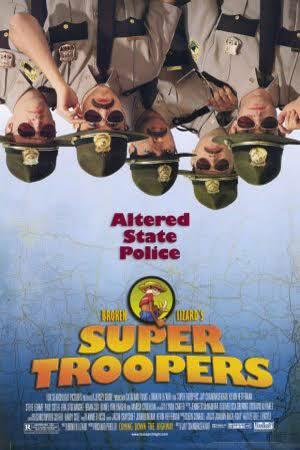 2000--Super Troopers--Five Vermont state troopers Get up to Wacky Hi-Jinks and even mange some police work. It's in the TVCU2 entry. The same actors from Super Troopers are playing campus police in Dukes of Hazzard (2005), with the same character names, and same personalities, in a film by the same writer/director. But Super Troopers also exists in the main TVCU timeline, so while Super Troopers 2 is in the main timeline, Dukes of Hazzard offers an alternate fate for two of the characters, in an alternate timeline. 2005--HAZZARD COUNTY--In 2005, the Humana Festival of New American Plays premiered a full-length comedy-drama entitled Hazzard County by Allison Moore. The story centers on a young widowed mother and a visit she receives from a big city television producer. Interspersed with recollections of Bo, Luke, and Daisy, the play takes a deep look at southern "good ol' boy" culture and its popularization through the lens of American mass media. 2013--AUTO TRADER--John Schneider and Tom Wopat have recently been featured reprising their roles as Bo and Luke Duke in ads for Auto-Trader.com. Then The General Lee gets replaced in the commercial with the new generation version which is a 2013 Dodge Viper which is General Lee the 2nd. April 2015--SUPERNATURAL--"Angel Heart"--Castiel tries to reconnect Claire with her mother who went missing, and calls Sam and Dean for help with the case. Sheriff at murder scene is Sheriff Coltrane. Relative? Not strong enough link for the Horror Crossover Encyclopedia, but a fun thing to include here on the website. Cartoon Universe 28--THE ROBOT CHICKEN UNIVERSE--A SEPERATE REALITIES AS DEMONSTRATED BY FAMILY GUY'S ROAD TO THE MULTIVERSE, WHICH HAS ITS OWN VERSION OF EVERYTHING, INCLUDING THE DUKES OF HAZZARD. Cedar and Willow Universe: Click here. A world where every famous person is really just a handful of scantily clad immortals. TVCU-15--THE CINEVERSE: Grady and Bobby Lee run moonshine for Uncle Jesse, who prides himself on his old-school moonshining methods, and refuses to buckle in to the 'big business moonshine' of Jake, who controls these parts for New York mobsters. MOONSHINERS is a 1975 film that inspired the Dukes of Hazzard. 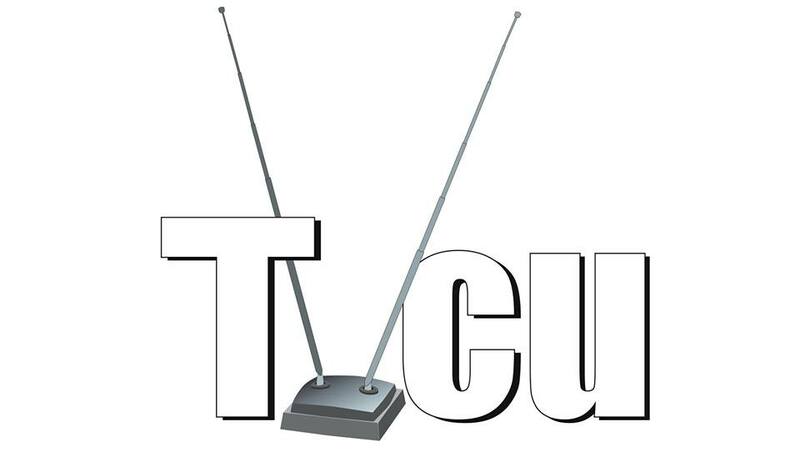 TVCU-21-A world where only what's seen on the TV screen is canon. Only one Superman operated in the 1950s and has passed away. Bruce Wayne was Batman in the 1960s. TOOBWORLD (Earth-Prime Time)--Click here. TVCU-38-A world with a secret history of heroes, monsters, and other things beyond what we see outside our window. Wold Newton Universe: Click here. Before we end, let's recognize the real reason so many men watched the show.